Fairy lore is one of my favourite subjects and I can rarely resist adding to my collection of books on fairies if I see one that interests me. When I was in a bookshop looking for a gift for a pagan friend, back before Yule, I saw A Complete Guide To Fairies And Magical Beings by Cassandra Eason. I ended up getting two copies - one for them and one for me. I'm a big fan of Cassandra Eason, having read a few of her books - my favourite being Cassandra Eason's Complete Book of Natural Magick - and having heard her talk at Witchfest. She is a very knowledgeable witch and her practical, down-to-earth brand of spellcraft makes a lot of sense to me. Cassandra originally published A Complete Guide To Fairies And Magical Beings back in 2000, but an new edition by Piatkus came out a few months ago - that was the one I picked up. Fairies can be different things to different people. They vary from culture to culture throughout the world and views of what they are like have changed through history. Cassandra's book looks at all of these things - from modern depictions of fairies back to the way our ancient ancestors saw them. This includes evidence for their existence such as photographs and written accounts as well as fiction, fairy tales and folklore. There are also many different opinions as to what fairies might be. To some people they are nature spirits or elemental entities, to others they are angels or ancient pagan gods while some people view them as beings from another dimension that sometimes overlaps with our own. Cassandra's book discusses each of these points of view evenly and in some depth. A chapter on the darker side of fairies looks at tales of abduction, changelings, fierce fairy creatures and malevolent fairies and explains that in history fairies were often seen as troublesome and dangerous. 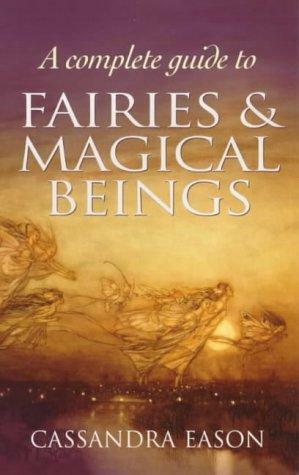 What I particularly like about this book is that as well as being very informative, each chapter ends with a practical exercise to connect with the world of fairies. Exercises include things like spending time in nature and attempting to sense the spirits that dwell there, visualising a fairy story in order to gain personal insights and walking a ley line to discover fairy sites along the way. At the end there is an A-Z of fairy beings, a list of suggested reading and addresses of useful shops and organisations. I would certainly recommend A Complete Guide to Fairies and Magical Beings as a good introduction to fairy lore and fairy magic and I've very glad I treated myself to buying a copy. Oh yes, well aware of Sacred Texts. It is listed under useful resources on the links page on my blog. A very useful site for older sacred texts.